We do love when the brands fight, don't we? When a brand fights a brand, a brand fights a person, or a brand fights the president, something irrepressible in us goes, huh, the brand is not people, yet it is acting like people, and then we clap and clap and clap. So anyway, here's a sign war. The conflict started in Scottsburg, Indiana (not something one says often) after a Popeyes opened near a Taco Bell. 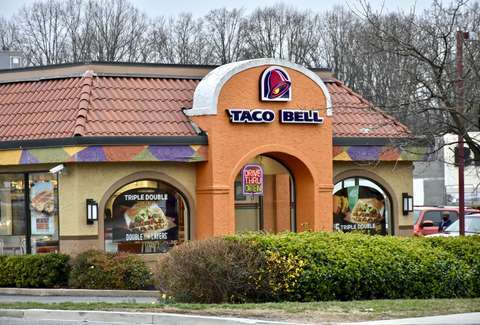 The Take Out points out that that Taco Bell had been there for 28 years, and it didn't take kindly to a person in a chicken costume clucking around outside near its turf. “We were pretty salty about it at first,” Whitnei Ward, the Taco Bell's general manager, explained to WAVE-3 News. As buildings do not turn into giant mech warriors (yet), the restaurants had to express their displeasure through other means. Naturally, they used their signs. It should be noted that the chains clarified that there is, in fact, "no bad blood in this battle of the signs," according to KXAN.